This product review looks at the Super Degreaser from Eco Solutions and it's various applications round the home. Cleaning grease and tacky adhesives from surfaces can involve buying very expensive products which, if only used for one purpose, are made even more expensive. Super Degreaser can be used pretty much every where for any number of reasons so we will have a look at how it performs. The video shows that we used a few ordinary household items such as Blue-Tack, double sided tape, oily finger prints and Selotape to test the Super Degreaser. These items were firmly stuck to the surface of a piece of painted timber so the test was extreme to say the least. 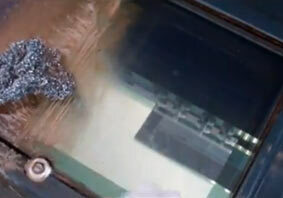 The Super Degreaser was also tested on a really filthy oven door as can be seen in the image below. The door was literally coated with grease and burnt food, the cleaning of which (with ease) shows that Eco Solutions claim that Super Degreaser will even remove carbon deposits is very real indeed. The trigger action of the degreaser is smooth and fluid. There is no jerky action which one usually associates with sprays of this kind. This ensures you get the most from a tube of the degreaser. While absolutely safe in all areas of health and safety it is advised not to leave Super Degreaser on a painted surface for too long as it can peel the paint. Not classified as dangerous to the environment or human health. It is not often that a degreaser actually does what it says it will do. Usually a great deal more elbow grease is required that is shown on demo videos and marketing material. This product however is excellent straight out of the bottle and requires nothing but a minimal amount of effort. We have awarded the Super degreaser 5-stars not just because it does exactly what it says it will do but because of the innovation behind this and all other products from Eco Solutions. Science, not solvents, really is the way forward.